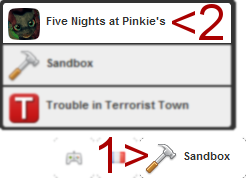 Welcome to the Sugar Cube Corner Replica, the first Five Nights At Pinkie's map available on the workshop. You don't need Counter Strike: Source! If you are curious, there is some hidden easter egg ! Subscribe to the 3 parts of the maps. Select the map or gm_construct/gm_flatgrass if your PC can't handle a direct loading of the maps. Can you people stop calling this cringe? Its Not as bad as Phyco girl Minecraft videos NOW THOSE ARE PURE CANCER. can u make a new map like fnaf 3? Just downloaded all the maps and the gamemodes, Freind and I both loaded the gamemode then hosted, I connected. Map is pretty spoopy looking and atmosphere is great but... Theres no Aminatronics? I don't think I did anything wrong.. We really want to play this game mode. Any help would be nice. Thank you for your time.